The mass of fused coins lay in a right angle created between the walls of a Roman building (probably the corner of a room). It was tightly packed in on the other sides by two stones, forming a stone-lined chamber. The hoard was not removed until its 'full extent was established and its position accurately planned and recorded'. Careful conservation work revealed the outline of the original bags in which the coins had been deposited. Sampling work was able to identify that the bags were made from 'skin product'. The hoard itself contained some 17,500 Roman coins, originally deposited in 8 bags. 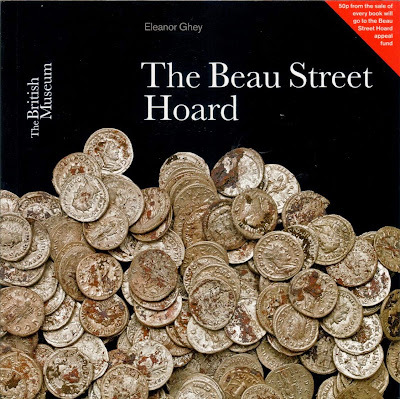 The Beau Street hoard is now the subject of a British Museum colour booklet by Eleanor Ghey (2014). It is a good reminder of the amount of information that can be gleaned from a properly excavated, conserved and studied Roman coin hoard. I was very struck by the imaginative ways that the Beau Street Hoard has been used to engage with the local community through a series of projects. Yes, but why is it in the PAS database (GLO-40A9B6) of non-Treasure finds made by members of the public? Was it just to boost the number of finds to over a "million" to match the BST propaganda? Why also has this hoard been catalogued by PAS staff instead of the excavators and has the commercial unit funded this work, or has it come out of the budget for recording accidental finds made by metal detectorists and other members of the public? What's going on? Do you reckon we'll ever get an answer from the PAS on these and other questions? When are the PAS going to STOP ignoring pertinent questions? Did you get any response at all from them over your PIA text, and if not, to what can this be ascribed?